The Lighthorsemen ells the story of the Australian outfit’s epic charge against the Ottoman Turk defemses at Beersheeba in Palestine during World War I. 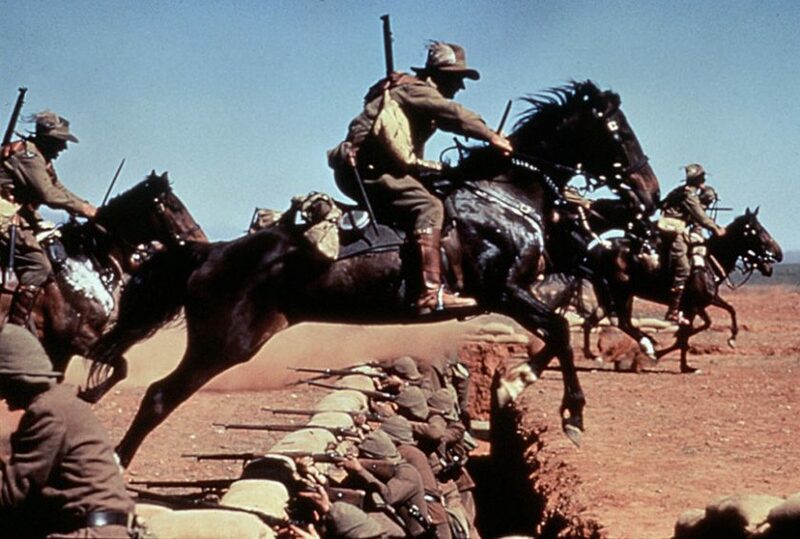 The Lighthorsemen is a movie about the Australian Light Horse regiments and their famous charge on Beersheba in Palestine in World War I. The taking of Beersheeba turned the Ottoman Turks out of their defensive line in Palestine and marked a turning point in the campaign in the Middle East. For the purposes of this essay; the charge is almost an anticlimactic moment. I wish that a different way could be found to teach history in our schools. History teaching incorporating the Australian Light Horse would be a lot more exciting than memorizing meaningless acts and dates. 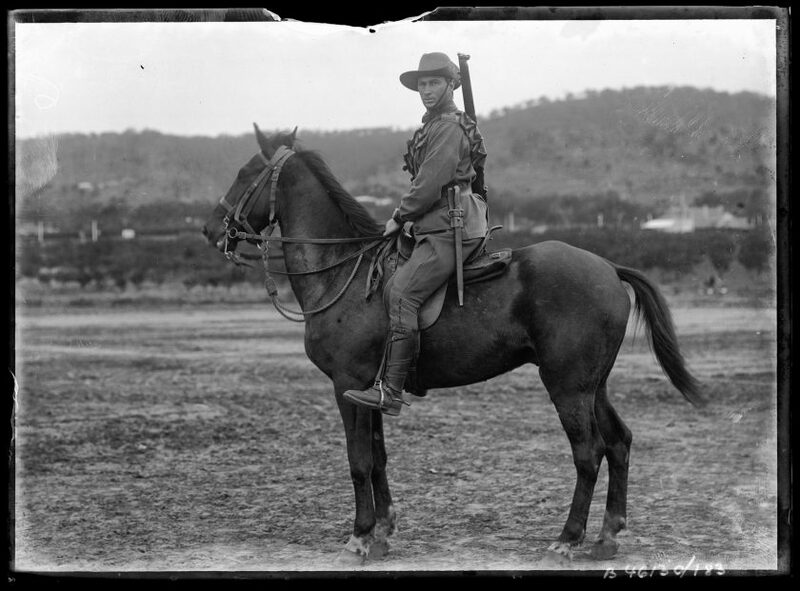 The “Australian Light Horse” — now there is phrase to stir the blood of any young man. With the recent kerfuffle over things like the Gillette ad and “Toxic Masculinity” and so forth, The Lighthorsemen stands tall and true as a symbol of true masculinity. It shows adult men being men together. I was fortunate to first see The Lighthorsemen after I saw the movie Dunkirk and the comparison could not be more stark. I hate the movie Dunkirk to the very core of my soul and with the heat of a thousand suns. I have never been to war, but to my core, I believe that The Lighthorsemen shows a truer picture of war than Dunkirk. Men die, but they have fun and they laugh and they ride naked on horseback into the Mediterranean. 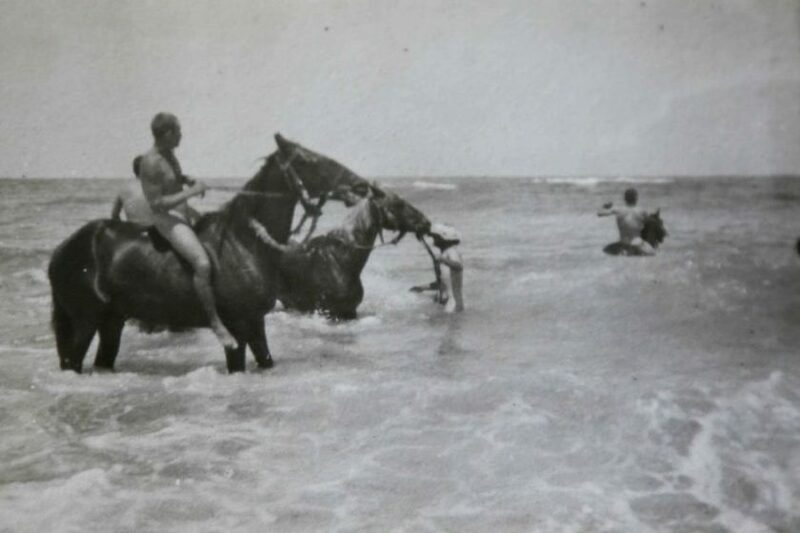 Period photograph of Australian Light Horse frolicking in the Mediterranean. Another key to understanding The Lighthorsemen as a personification of true masculinity came from one of my favorite books “Quartered Safe Out Here” by George MacDonald Fraser. “Quartered Safe” is Fraser’s memoir of World War II in Burma. Fraser describes a squad mate that he calls “Forster.” Nobody really liked Forster. Forster was meaner than the rest and a bit of a bully. However, when you found yourself hesitating in the mouth of a Jap bunker and looked to your right; Forster would be at your side, just like you always knew he would be. “Forster” is in The Lighthorsemen too, by another name. He is universal. Every group of guys has a Forster. I think every group of guys needs a Forster. On the other hand, Forster needs the group too, his rough edges are polished off and they all make everybody better. One of my favorite scenes is when the Australians walk into a bar and start getting razzed by English troops with the obvious potential for a bar fight. One of the Australians, who obviously likes to fight, is held back by his mates and they walk out of the bar. 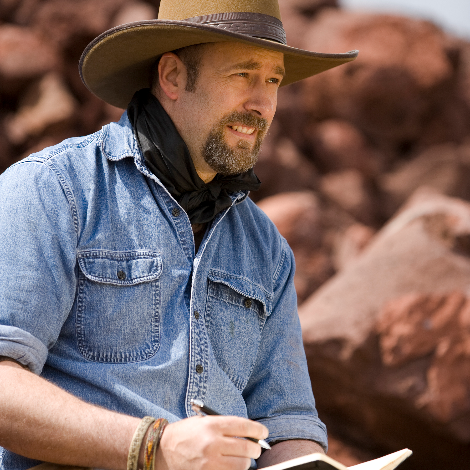 At this point in the movie, the Australians have been held in reserve and the English have seen heavy fighting, so that is what the razzing was about. However, both sides know that they will be fighting side by side against the Turks next week and they are just testing each other. The “Bar Fight” is universal. I have seen it in my own life. We lost a football game that we should have won and 35 years later it still haunts us. It still lives with the victors too, it is one of the great shining moments of their lives and they treasure it as one of their great memories. Whenever, we (the losers) run into a member of the winning team, they crave talking to us about it, not to brag about it, but because they can talk to us about it. We were there with them, tested on the field of battle and we understand just how big a deal it was. It is within us all till our dying day. Anyway, the winning team was trying to find a tape of the game and ran across a key member of our team in a bar who has tapes from that time. One guy asked nicely for it and my friend might have given it to him, but then their “Forster” smarted off and no way were they getting the tapes after that. I joke that the two schools should have a class reunion together and we could be 70 years old and it wouldn’t be very long until the fists started flying as emotions will still be raw and we all crave to be tested against each other again. Another favorite scene is the goodbye scene between the nurse and Dave, the main character, in a train station. Dave had been wounded and the nurse and he had fallen in love. As the goodbye continued, you can tell that Dave is thinking, “Enough with the goodbyes, I have to go now.” It is time for him to leave for the wars now and he can’t get away fast enough. There is something universal in that scene about true masculinity. We have to leave as a knight on the Crusades for Jerusalem. But, let’s not fool ourselves, we don’t “Have” to go, we “Get” to go. The Lighthorsemen features the man we all wish we were: Colonel Richard Meinertzhagen, the lone scout against the Turks. The clever trickster who fools the enemy by a risky gambit. “Meinertzhagen” is universal. We all wish we were him. The Lighthorsemen has the universal theme of the replacement having to prove himself to the older, more experienced men. They don’t make it easy for him. They test him and make him better. He won’t be a man in his own eyes until he meets the test. “The Test” is universal. A man has to be tested to be a man in own eyes and we have largely lost that in the modern world and that is why so many of our young men are lost. There is no way for them to become men in their own eyes. To become a man in your own eyes is the most important feature of true masculinity. Even more than that, I think to be a man, a man has to feel that he is a man in his father’s eyes. The Lighthorsemen is an ideal picture of true masculinity. Every facet of true masculinity is perverted in gang culture, but I think even that perversion shows how much men crave the ideal model. It is ingrained in us. The attacks on traditional masculinity won’t even let our young men know the model exists and they can’t understand what they are craving and are being forced to feel they are wrong somehow for being who they are. They are lost with nothing to grab on to. Dave Wrolson, our Breaker Morant gets the credit for this one. Yes; excellent. And dang–I’ve not seen this film yet–I obviously need to rectify THAT. I DID see “Gallipoli” many, many moons ago. As for such “comrades and mates in arms” being ingrained in male DNA–you have NO IDEA HOW ingrained! You should watch a group of wild male chimpanzees gathering together to go off on a territorial patrol against their enemy neighbors! The similarities are STARTLING! I also have the time‐tested “Circumcision group” thing that tribes have used for millennia in mind. You might not like all the guys in your group but they are your “mates” and you go to battle with them and so forth. There is something important about the idea of boys stepping into manhood together that we have lost. MANY so‐called “primitive” tribes around the world had both male and female puberty ceremonies, where young people–once they “passed”, were accepted fully as adult members of the tribe, and all the rights and respect that came with adulthood, totally side‐stepping that awkward, confusing phase our modern Western society refers to as “teen‐agers”. And they didn’t have the delinquent problems so commonly experienced in our society’s expectations of teens. Very wise. I’d venture a guess a significant part of our troubles in the modern western world come from how badly have been mishandled rites of passage. What few remain have been so diluted as to be worthless. Helicopter parenting precludes exposing a child to the kind of risk necessary to properly mark the occasion. And as far as boys are concerned, any time a traditionally male ritual expands to allow females the lure is soon enough diminished to the point of irrelevance. If a girl can be a man, too…honestly, where’s the prestige? The Marine Corps still has an extremely effective rite of passage, and remains a warrior culture — one reason it is under constant attack in our culture. But it is difficult to point to very many others. Thank You, Frank. I enjoyed writing it. Hats off to Jim for the pictures. They are perfect. Aussy’s are great guys tough bastards‐ remember them fondly from the PI. Great Allies and world famous fierce fighters. Their bar room antics are long house Viking like‐ legendary and epic. Just found a book about a guy who rescued tens of thousands of Assyrian Christians at the end of WW1. “Debt of Honour” by Sarah Lindenmayer is jumping high in my list. In George MacDonald Fraser’s collection of “Private McAuslin” short stories” the one called “Night Train to Palestine” has a fun vignette of Australian soldiers and RAF pilots in competition for some nurses in a bar on the train. 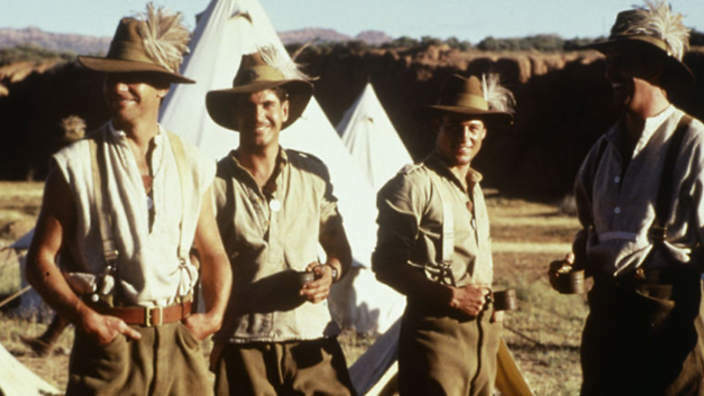 A great companion movie is Gallipoli (Peter Weir, 1981). I’m sure you’ve seen it but if not, you absolutely must. One of the finer ones that will zap you at the DNA level. A good documentary in this vein would be The Battle of Long Tan, presently available on youtube, centering on the 1st Australian Task Force facing off with a numerically superior NVA regiment outside Nui Dat in 1966. Probably one of the better Viet Nam productions I’ve seen. Tough bastards ain’t the half of it. Great job, David! You nailed this one.